Old San Juan is a 465-year-old neighborhood originally conceived as a military stronghold, it is contained within 7-square-block and includes more than 400 carefully restored 16th- and 17th-century Spanish colonial buildings. Old San Juan is not a big area and the best way to fully submerge yourself into its culture is walking through its streets. You want to see all the details - the architecture, people, food and street life. Most attractions are within walking distance of each other. 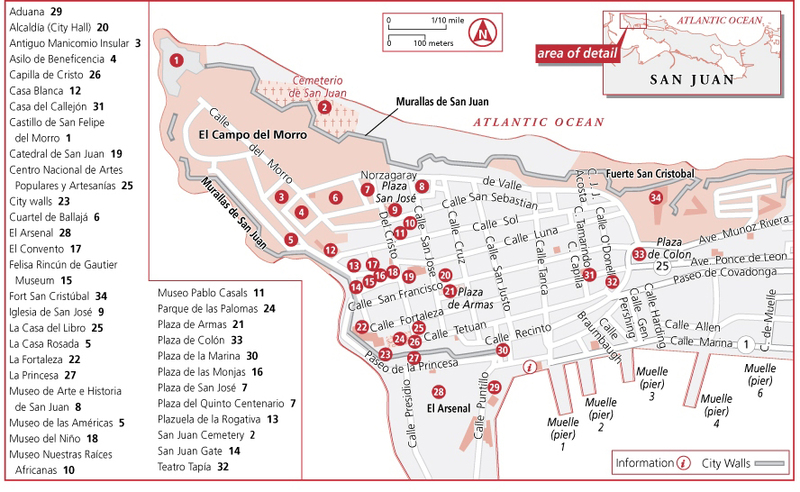 After your visit to San Cristobal continue on Norzagaray Street toward Fort El Morro. You can't miss the massive Castillo de San Felipe del Morro ("El Morro") across the old city. This six-level fortress rises 140 feet above the sea with its massive 18-foot-thick wall proved a formidable defense. El Morro is a National Historic Site administered by the National Park Service. The fort is open to the public everyday from 9am to 6pm (except on Thanksgiving, Christmas and New Years). Admissions US$3 adults, children under free, (787) 729-6960. Now walk to the Plaza de Beneficiencia along San Sebastián Street until you get to Cristo Street. Check out La Catedral de San Juan, El Convento, La Capilla del Cristo and the Parque de las Palomas. Continue on Cristo Street and you will find the San José Plaza, nearby the Casals Museum and the San José Church. Soon enough you will reach Plaza the Armas where you can seat across the city hall and enjoy the view, this is Old San Juan's main square, on San José Street. Walk to Plaza Colón then into San Francisco Street, where you can stop for lunch or grab a quick snack. Along the way take your time and browse all the stores and sights. Do not forget to stroll Paseo de la Princesa, a 19th-century esplanade situated just outside the city walls. Make sure to do this walk during sunset, I guarantee many breathtaking photos.